We did an email interview with this Russian Sports news media, MatchTV, and they published an article. Click HERE to see the article in Russian. It starts with your text from the petition to IOC and contains KoreanDogs.org address. The author refrains from condemning dog meat trade, bur notes that those who will go there could face “a huge cultural shock”. Then he asks sportsmen who attended the 1988 olympics – some say they never saw dog meat, others say they tried it, but didn’t find it delicious. They don’t believe dog meat gives any health benefits. Then follows your interview. They arranged it clearly as “we achieved nothing”, and the article ends with assuring readers that Korean government will hide dog meat trade during the Olympics, so there’s no risk that foreigners will see it. 1. Did you receive any reaction from IOC? http://www.koreandogs.org/pc2018/ We have a variety of campaigns in this page. Did you get any reaction from National Olympic Commitees? No, we have not received a response from the NOC directly, but several of the members of the NOC have responded. 2. Are there any countries that ready to boycott winter Olympic games? As far as we are aware, the answer is No. 3. Do you plan to make any actions (protests, demonstrations) during Olympics?We are a small volunteer organization. 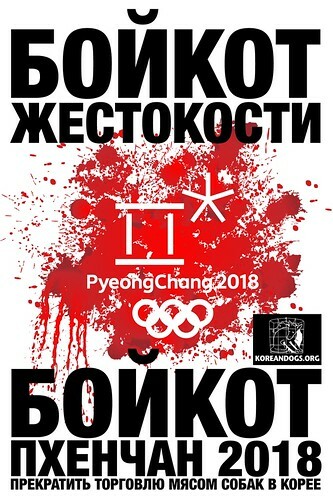 We currently do not have any plans for protest or demonstration specifically for boycotting the PyeongChang 2018 event. However, we have a regular event which I organize, at the San Francisco Fisherman’s Wharf against Korea’s dog meat trade. 4. Is it possible that Olympics will be cancelled because of dog consumption? No. It is not very likely. However, the Olympics is an excellent opportunity to raise awareness of this horrific practice that has been ongoing far too long in Korea, so we are trying to use this opportunity to expose it to the world to put pressure on their government to take action to end it permanently. And, our campaign is working. For the first time in South Korean government history, they have a lawmaker who has committed to legislate the banning of dog meat. We believe this is a sign that change is beginning to happen and we are very hopeful, that with continued campaigning, the end of dog meat and cat meat cruelty in Korea is possible. 5. Do Korean government struggle against dog consumption (if yes, what they do)? The Korean government is indifferent toward this issue. To date, the government has done nothing to end this practice, nor have they even tried to tackle this issue. That’s because there’s a profound indifference or perhaps unawareness of the majority of the population regarding the suffering of these animals in the dog meat industry. The government under the former president Park Geun-Hye’s leadership, did not have an interest in addressing this issue. Now, with the new president Moon Jae-In, we believe this issue will get more attention. The South Korean government is fully aware that they cannot continue this horrific practice, but no one had the courage to take action against it because of the backlash and resistance from the dog meat industry, as well as the dog meat consumers. The Korean government knows that they can no longer ignore this issue. We are still waiting for President Moon to take action to end this practice. 6. Did your petition changed anything? We believe that our petition did make a difference in raising awareness to the world about this urgent and important issue and has helped put the pressure on the Korean government to take action. It did not result in any countries actually boycotting PyeongChang 2018. However, the fact that we helped to shed light on this atrocity, we believe, brought us closer to the end of the dog meat trade in South Korea. We are a small organization of volunteers with limited “reach” to the global community. With the help of our supporters in sending letters and signing petitions, we hope to save millions of animals, especially with the help of the media in spreading global awareness. Bravo to you Korean Dogs especially you Giny Woo for creating this awareness. Love you for it. We WILL get there in the end !